It took me ages to finally pick up a Too Faced Melted Liquid Lipstick and now I have a happy family of five different shades. It's one of those products you have to actually try to really understand the hype and fuss. It goes on quite wet, but dries to a matte, stain finish that lasts ages. The packaging is great to squeeze out the last drops of product if you magically get yourself to that point. They're pigmented, bright, and have some of the weirdest names. During the holidays I was gifted a set of four smaller tubes which I actually prefer over the full size. You still get loads of products in much more travel-friendly packaging. The far left is "Melted Metallic Peony," a rose/blush pink. The deep maroon is "Melted Berry," a shade I'll really have to psych myself up to wear it's so pigmented. The other three are all very close in color to my go to shade preference. "Melted Fig" is purple toned, "Melted Metallic Macaron" is more pink, and "Melted Chihuahua" is smack dab in between the two. I'm definitely covered in the mauve department, but of course I doubt that'll stop me. One can never have too many variations of mauve. 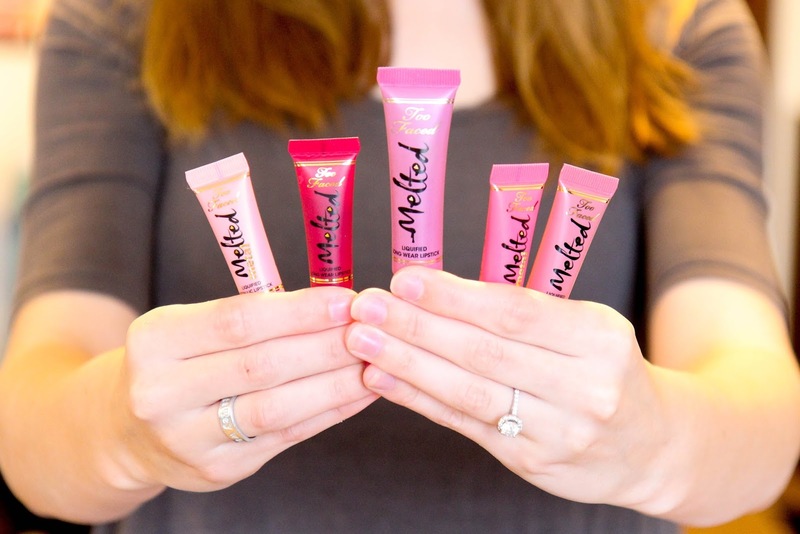 Have you tried these melted liquid lipsticks yet?